Crochet moss stitch is a very simple crochet stitch pattern. It's a great advanced beginner stitch pattern to learn once you've learned how to crochet the basic stitches. In fact, it's one of the most popular crochet stitches. Crochet moss stitch, also called granite stitch, combines single crochet with chain stitches. It's a repetitive pattern worked across the row. Basically, you create chain spaces across the row, working single crochet into the chain stitches from the row below. 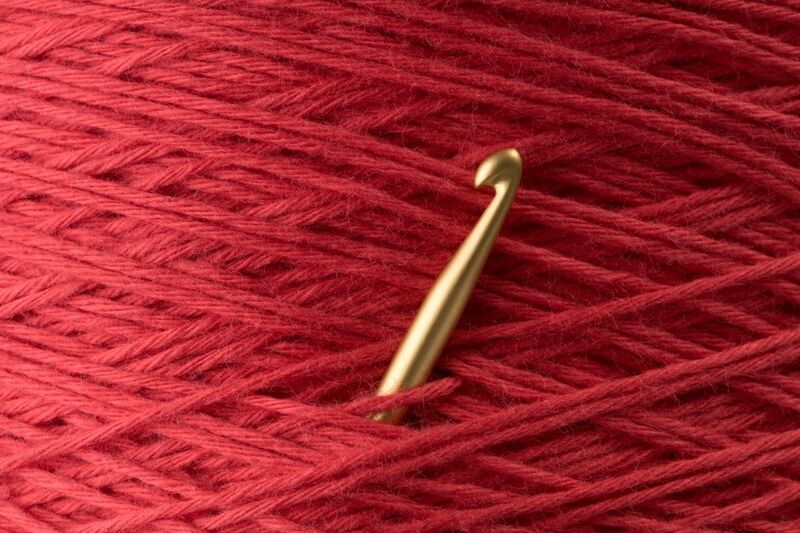 When you add row upon row in this stitch, you get a beautifully textured design. It looks a lot more detailed and complicated than it actually is to crochet, which allows you to make projects that you'll really be proud of, even if you are a beginner to the craft. Since this is such a simple crochet stitch pattern, you can easily use it to make almost any type of project. As a beginner, you might not want to worry about how to increase and decrease in this stitch pattern, though. Therefore, many of the crochet moss stitch patterns that you will find are square or rectangular projects. Washcloths, dishcloths, scarves, and blankets all look great in crochet moss stitch. That said, as you gain experience with the stitch, you'll be able to do more shaping so that you can make other projects as well. This is one of the best moss stitch crochet patterns for beginners. That's because it shows you exactly how to work crochet moss stitch. Moreover, the project is large enough that by the time that you're done, you'll really have gotten the hang of the stitch. Then you can use it to create your own projects. It's an easy crochet baby blanket pattern available in three sizes for preemies, newborns, and toddlers. This is the perfect blanket to gift to anyone with a new baby or even to donate to charity. Some people find it intimidating to start with a crochet blanket pattern when learning a new stitch. The main reason is that you have to chain a long chain at the beginning of the project, which leaves ample room to mess up in those first few rows. Crochet moss stitch is a really easy stitch, so you don't have to worry too much about that. However, you could always start with this moss stitch crochet scarf pattern instead. It begins with a chain of just fifteen, so you can easily practice moss stitch in those first few rows, and if you make a mistake then it won't be a big deal to rip it out. You end up with a 4" wide crochet moss stitch scarf that's a perfect all-weather accessory. It has just the right amount of texture to make it special. If you want to start with a smaller project, then this crochet headband pattern is the way to go. You begin with a chain nine to start the project. Then you just work a series of rows until you get the size that you need, stitch it up into a headband shape, and you're ready to wear it. It's a really cute project. Plus the moss stitch is actually perfect for a headband because it has just the right amount of give for the stretch that such a project requires. Did you know that you can crochet fingerless gloves without any increases or decreases? Basically, you just crochet a rectangle, then seam it up, leaving a space open to create thumb holes. Making gloves takes you to the next level beyond just crafting crochet scarves and other beginner projects. Therefore, this is a great next project for you to try. Like the other projects here, it begins with a simple crochet moss stitch rectangle. Once you have really gotten the hang of crochet moss stitch by making projects worked in rows, you're ready to learn how to work it in rounds. This free crochet beanie pattern is the perfect place to start. As you work this crochet hat pattern, you'll gain a sense of how to increase in crochet moss stitch. You can apply that to other projects, worked in the round or in rows. Tip: Once you've learned crochet moss stitch, you might want to also learn crochet seed stitch. It's very similar, except that instead of using chains and single crochet, it uses single crochet and double crochet stitches.